If your children are anything like mine, they have days when they grow weary of their usual toys and games and boredom creeps in. With summer just around the corner, I’ve been looking for simple and engaging activities for my children that can be completed fairly quickly, but enjoyed for days to come. 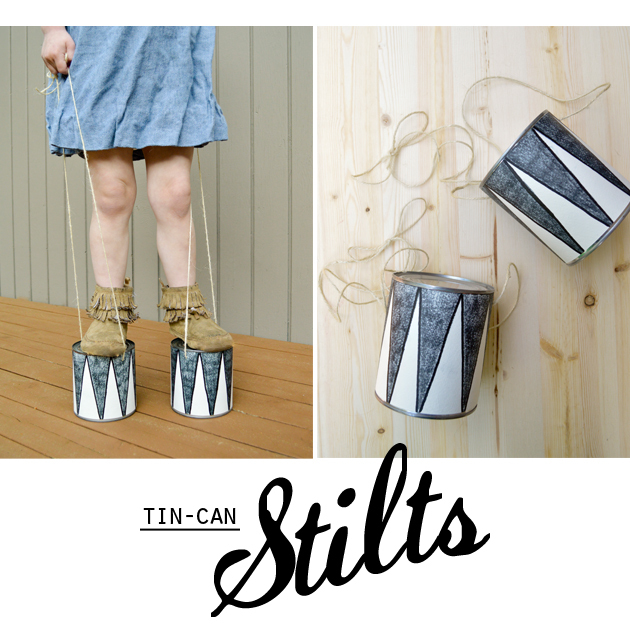 These “stilts” are super fun and have the added bonus of encouraging the children to go outside and move. They can be made fairly quickly with materials you may already have on hand. Hopefully you will enjoy racing and running through the yard with these as much as we have! 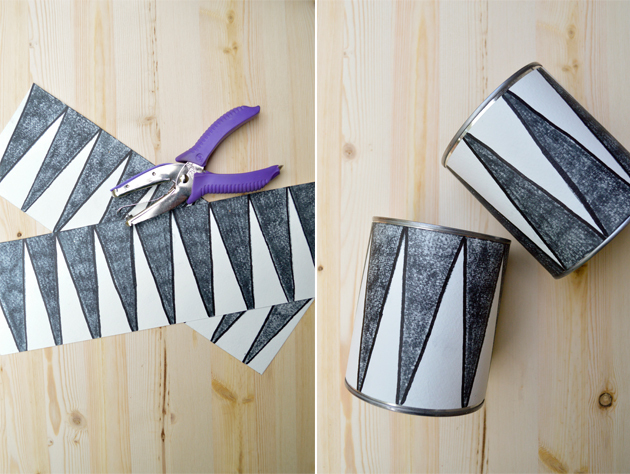 To make one pair of stilts, gather: 2 28-oz tin cans, hammer, medium or large nail, string or twine, tape, scissors, hole punch, paper, and markers or crayons. 1. Remove label from cans. Wash in warm soapy water, rinse, and dry. 2. Cut two pieces of paper that are 13.5″ wide x 4.25″ tall. Decorate with crayons or markers! 3. Punch two holes in each strip of paper, about 3.75″ in from each end and about 0.5″ from the top. 4. 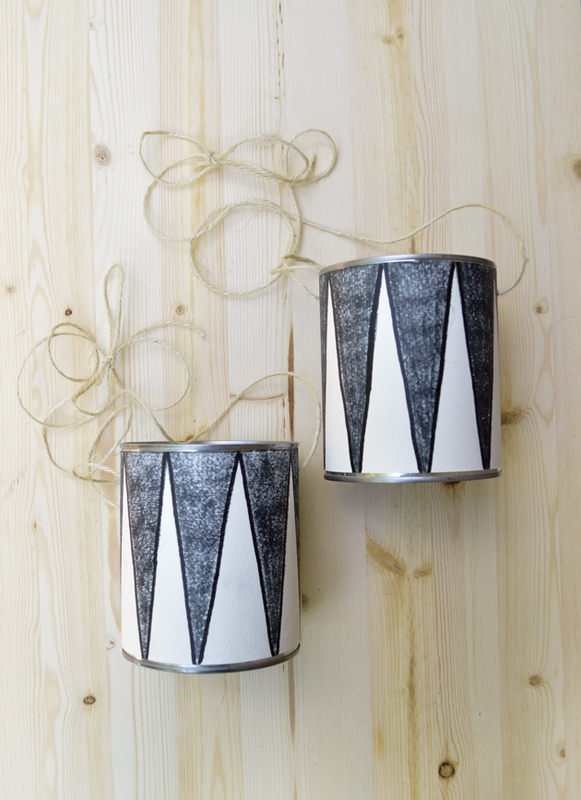 Turn cans over (bottom side up), wrap paper strips around each one (hole-punched side on top), and secure with tape. 5. 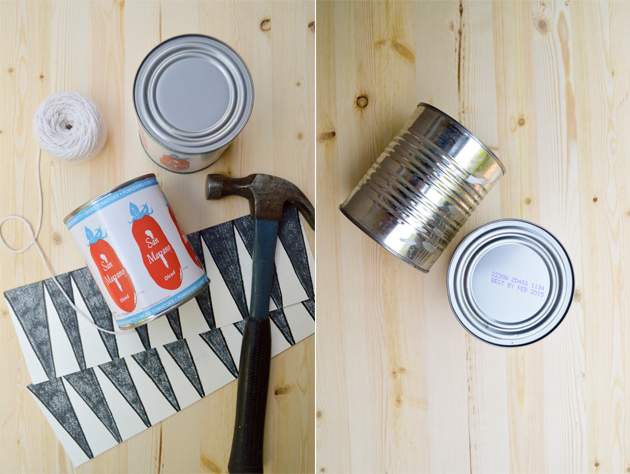 Using a hammer and nail, punch holes in each can where the holes in the paper are. Do this by tapping the nail in with the hammer and then carefully pulling it out. You should end up with two holes opposite of one another on each can. The nail pictured above didn’t give me a big enough hole, so I switched to a slightly larger nail (not pictured). 6. 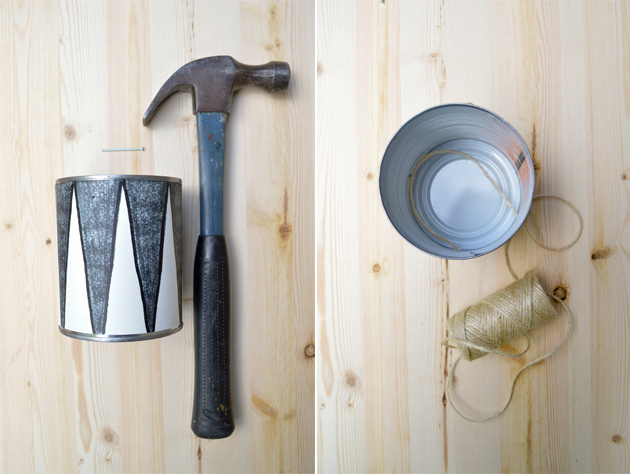 Grab one end of a roll of twine or string and push it through one of the holes in your can. Pull the string through the inside of the can and push it out through the other hole. Keep pulling string through until the strings on either side of the can reach thigh-height on the operator of the stilts. Tie a knot at the top of the strings, creating a loop. The operator of the stilts will make them work by standing on the cans and pulling up tightly on the string loops as they walk. With a little practice, your children will be running around with these in no time!